Ah! The wide open spaces in the US! At least in the early game. This map will fill in quickly. Do you know how many borders Kentucky shares? Do you know how connected Tennessee is? Do you know just how big Texas and California are? And do you know how great it is to have non-contiguous states Alaska and Hawaii in the union? 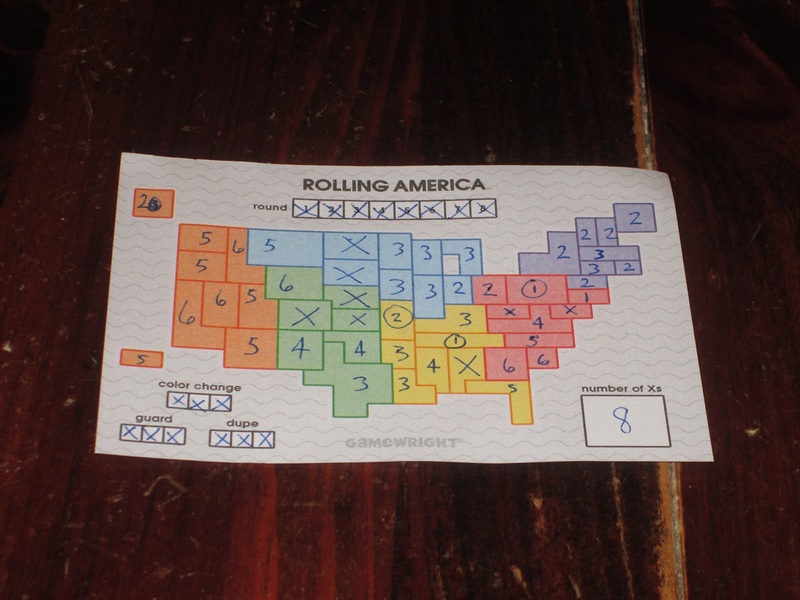 Rolling America isn’t didactic, but you’ll learn all this and more as you strive to solve the puzzle and have the most numbers written in your map. 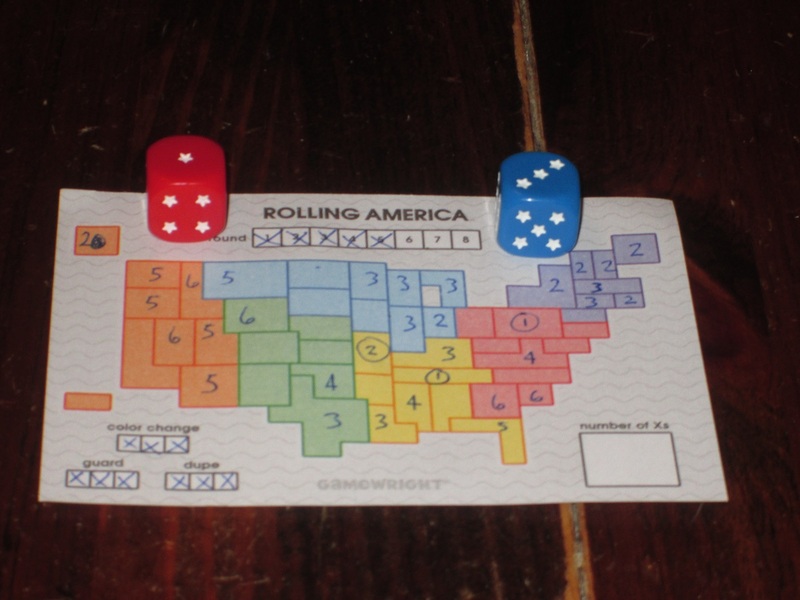 Rolling America is a pen-and-paper puzzle game for one or more players. Each round players will roll six dice, two at a time, and each player must assign those dice to states in their US map or take an X. The player with the fewest Xes at the end of the game wins. To begin, each player receives a score sheet/map of the United States. The map is divided into six regions matching six colored dice. On a turn a player will draw two dice from the bag and roll them, and each player must, if able, write the number rolled in a state of that color on the map. The catch is that neighboring states can have a maximum difference of 1 between them. (So, for example, if a 3 is written in a state, all neighboring states must have 2, 3, or 4 written in them.) Also included in the bag is a wild die, whose value can be assigned to any state on the map. Players must write a number on their map if they can legally do so; if they can’t, they write an X in one state in the region whose die they can’t use. 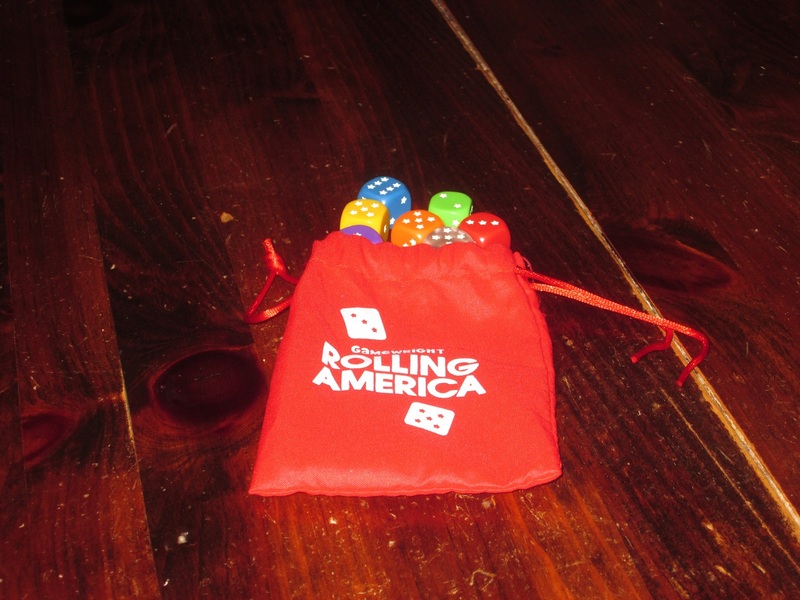 The dice and dice bag for Rolling America. The dice bag is a nice touch, and the dice are very high quality. Each player also has three abilities they can use three times per game: color change (change the region a die can be assigned to), guard (write a number in regardless of whether it follows the neighboring states rule), and dupe (duplicate the value and color of a die to use it twice). 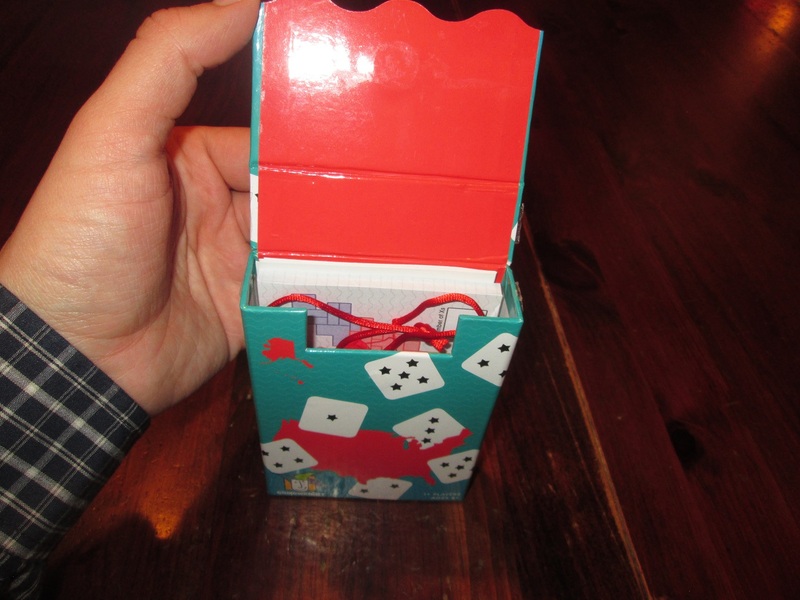 Once six dice from the bag are drawn, all the dice are thrown back into the bag and a new round begins. The game ends after eight rounds. After the eighth round, players place Xes in any empty states on their maps and pass them to the left so another player can check their work. The player with the fewest Xes wins. I’ve Traveled Every Road in This Here Land? Rolling America is exactly what I want out of a filler puzzle game: it’s quick and simple to teach and understand, yet it offers tense and interesting decisions throughout. The rules for Rolling America are on a single side of this map-folded paper. English and Spanish rules are included, and the game’s components are language independent. 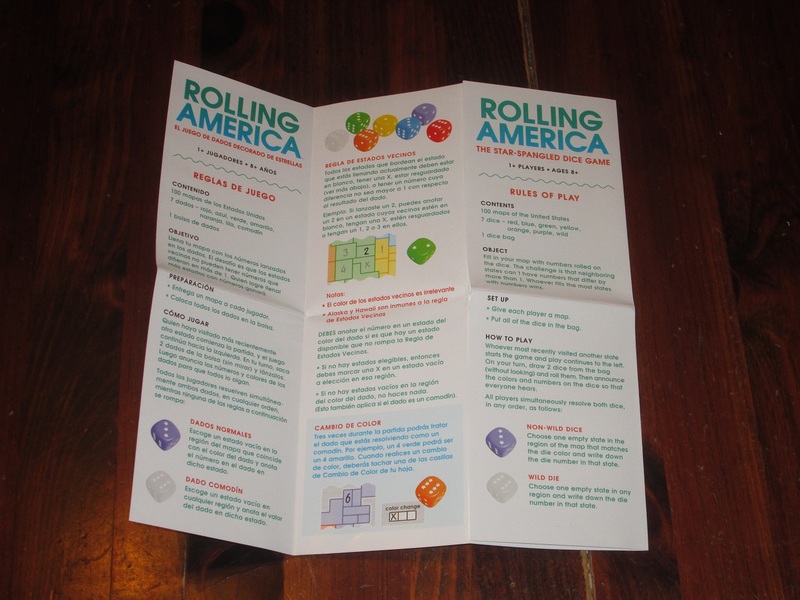 The rules to Rolling America are super simple–so simple that they are included on a single map-folded sheet (a nice touch), with Spanish rules on the other side. Players take turns rolling dice, and after each roll, every player has to write that number somewhere on their map where it fits. When I read the rules, and at the start of my first game, I thought, This is so easy. I guess it is a kid’s game… But as the game progressed, I quickly realized just the kind of trouble I was in for. Rolling America begins with a wide-open map of the United States. You look at it the way the early American colonists did: lots of room to expand, large grounds for hope and optimism. And almost as soon as the game begins, your hopes are dashed as you recognize just how much your early decisions have boxed you in. The reason the game initially seemed easy to me is that I thought of it like a grid. Numbers in rows and columns; put them where they go. Simple. But Rolling America is interesting in that, while the map is still an abstract representation of the United States, the shapes of the states are not straight squares and rectangles, so states border each other more than you think. States like New York, Kentucky, and Tennessee quickly become unwieldy when you realize how many borders they share with other states, and all neighboring states have to follow the “neighboring states” rule. Because of the nonstandard state shapes in the game, every round is interesting. Where will you put your numbers? When will you use a color change to get rid of a pesky digit? When will you duplicate something to fill a region faster? And when do you give up and just guard a number? You have to write a number down if you are able, which isn’t always advantageous, so the game revolves around using your special abilities to great effect. Rolling America involves a hearty dose of luck–the game does center around rolled dice–but there are a good deal of luck-mitigation decisions on the part of the players. It’s midgame, and already things are getting tight. Now where can I put this red 1 and blue 3?! Rolling America won’t be for everyone. For starters, this game really is multiplayer solitaire. Aside from everyone performing the same activity at once and awarding one winner, the game is a solitary one: each person is writing on their individual map, making their own decisions, and there’s nothing anyone can do to affect another person. Some may look at this as a flaw (indeed, you can play the game solitaire and not miss any of the “game” that takes place with eight players), but I really like this. My aunts, grandma, and I used to buy the same Sudoku books so we could competitively solve Sudoku puzzles. (Yes, my family is awesome.) The camaraderie of doing the same activity enhanced the joy of solving a puzzle, and I find the same principle at work here. The game is fun solitaire (and plays much more quickly when you don’t have to wait on Anthony Analysis to write in his numbers), but you miss out on the Bingo-like joy and despair of commiseration in the competitive game. 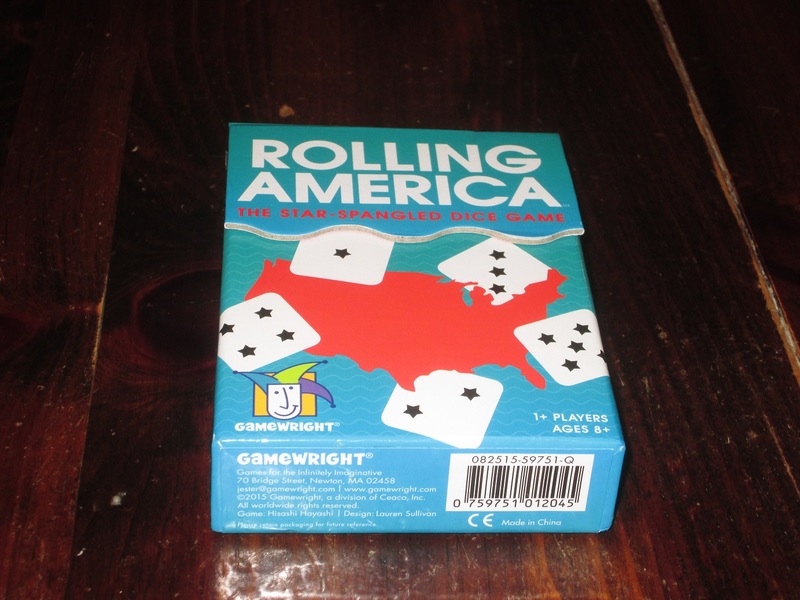 Rolling America, as already mentioned, also has a large dose of luck, which will turn off some players. You may write your early 6s in Alaska and Hawaii, only to realize that in this game higher numbers are rolled instead of lower numbers, and you wish you had decided differently. There can be some frustration here in that you have to make decisions before you know what will be rewarded as good or punished as bad decisions. I haven’t seen much real frustration in my games–at least, not much game-ruining frustration; more like the frustration when the Bingo caller refuses to call your number–and as long as the players understand what they’re in for, I think this is more feature than bug. Finally, the game will be fairly similar from game to game. Again, like solving a Sudoku puzzle, while each puzzle is different, the activity and the process of “solving” it will be quite similar from game to game. For me, this isn’t an issue: I could solve Sudoku puzzles all day, and I’m pretty sure I could play Rolling America all day too. The puzzle is wholly engaging, and while the process of each puzzle is similar (and I wouldn’t know or care if I’d somehow gotten the same rolls from one game to another), I’m engrossed and interested in solving it. The package of Rolling America is quite nice. Everything fits inside this small, magnet-closure box. It really can go everywhere. All told, I have been quite impressed with Rolling America. It’s quick, fun, and interesting enough to make it a frequent choice at my game table, and I like how versatile it is. There aren’t many games that can scale well from one player to as many players as you’ve got, but Rolling America is perfect for those situations where more people show up than you were planning on accommodating. I’ve played it with non-gamers, casual gamers, and people who play games as a hobby, and it has gone over well with all groups. There aren’t many games that will please a large swath of people, but much like the sprawling United States, there seems to be something for everyone in this travel-sized box. And I’m glad it’s travel-sized, because it really will go everywhere, man–in my backpack. 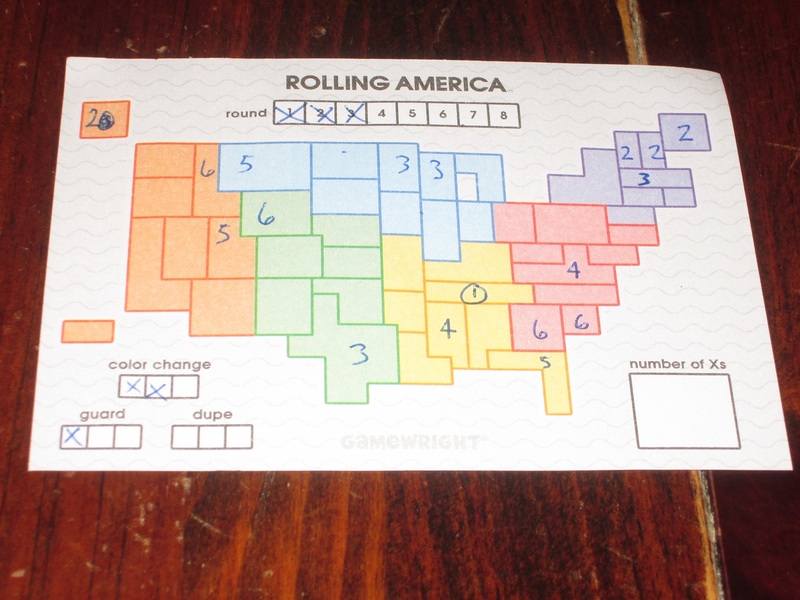 iSlaytheDragon would like to thank GameWright for providing us with a review copy of Rolling America.